I cried when I received the phone call. This time, it was tears of joy. It was the best phone call I received in days. 50K. BEST.BIRTHDAY.GIFT.EVER. Thank you Lord! You are an amazing God! In fact, during lunch, I was giving the law of attraction by Rhonda Byrne a try, which includes winning this contest as one of my intentions. A few hours later, a magical moment happened and the law of attraction worked again, giving me the best birthday gift ever for my 26th year which will be in 2 days. Of course, I wasn't the only one who got blessed today. I would also like to share my blessings to 5 of my readers who will be getting P10k worth of GCs from Sulit.com.ph as well. Congratulations! I believe I would not win this without the help of my friends and readers who took time to respond and to post comment on my entry. Thank you very much for your big help. Thank you very much for responding to my FB messages even though I know you get annoyed with receiving group messages. 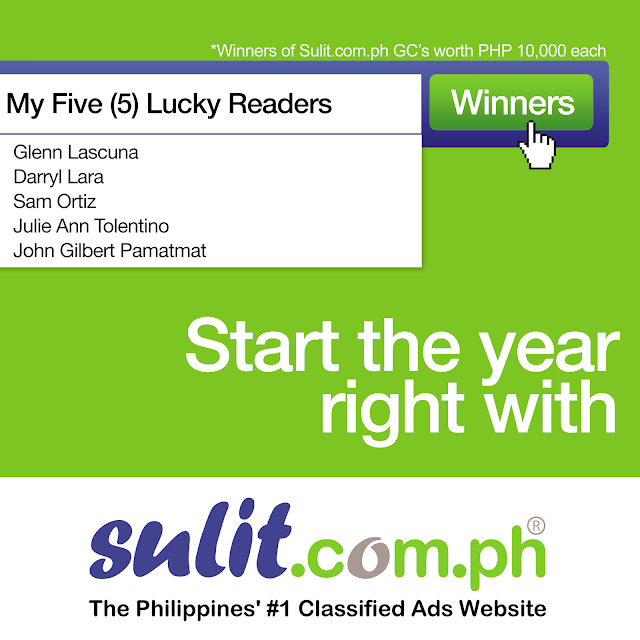 Thank you to the people who also campaigned regarding my blog entry and to my friends in Davao Bloggers who commented on my entry and syndicated about this contest to their different blog groups. Thank you to all who supported me to join this. Thank you also for those who ignored my messages asking for help for your rejections have strengthened my faith in prayers. Thank you also to my friends who helped me in applying the law of attraction. Thank you Nuffnang Philippines and Sulit.com.ph for this once in a lifetime opportunity. This has been the biggest winning I had so far in my 26 years of existence. Thank you for allowing me to experience this. Most of all, I thank the Lord God for listening and answering to my prayers. When God closed a door for me, He opened the roof to allow more blessings to come pouring in. Thank you. Thank you. Thank you. I'd just like to share one thing I realized in the past few months. You might have read this in my previous blog entry when I won a shopping spree but let me reiterate this again: There are times when we are subjected to trials which may overwhelm us, but trust me, when you change your perception on how you view things and do your best to look at them on a positive light instead, more blessings will come into your way. What you focus on grows so better focus on the positive things rather than on the negative ones. Ask. Believe. Receive. Have faith. With this, I am going to welcome my 26th year of existence with so much gratitude in my heart and will live on it for the rest of my life. Thank you. Thank you. Thank you. I guess I already said a thousand thank you's for today but I will never allow myself to get tired of being grateful. Thank you for making me start my year right. Again. 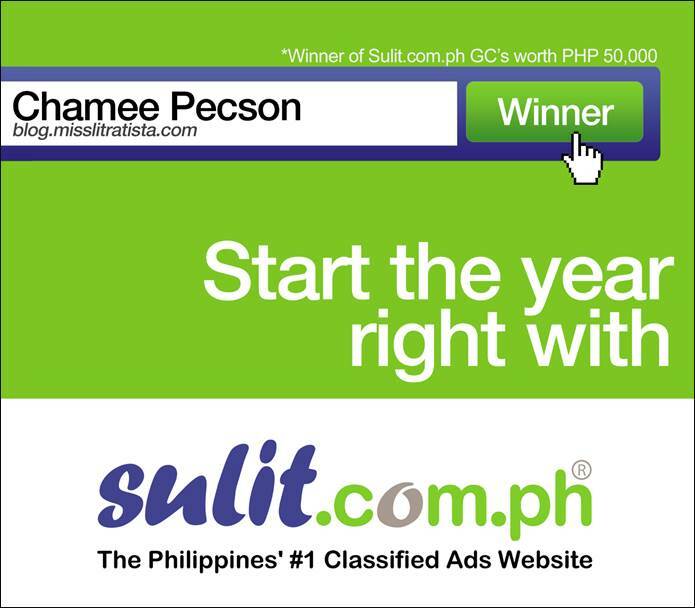 Congratulations Ate Chamee! :) Share your blessings! :)) Patudlo ko anang Law Of Attraction nimo bi. Hahahaha. thank cham! nadamay ko sa imong law of attraction! scallops on monday! Congratulation Ms. Chamee! :) You're indeed too blessed!